The Fox Newsroom designed by Gensler specified 66 individual workstations enclosed by curved privacy panels, with each configuration requiring a unique radius. Our materials, details and finishes matched surrounding Knoll project furniture. Overlooking New York's Central Park, hedge fund Braver Stern demanded a striking conference table. Using 3" thick solid Clara Walnut, we created this unique table with integrated cable management. At the touch of a finger, an invisible 6" square panel at the center of the desk rises with a series of data and power outlets. Five position aircraft dispatch desk for a fleet of corporate aircraft, with integrated cable management. Details and materials match adjacent systems furniture. Teller line for New York City Employee Retirement Fund. Diverse range of architect specified materials include Corian, Caesarstone, cherry veneer, high pressure laminate and stainless steel. We factory prefabricated modular sections and cleanly assembled all components on site. 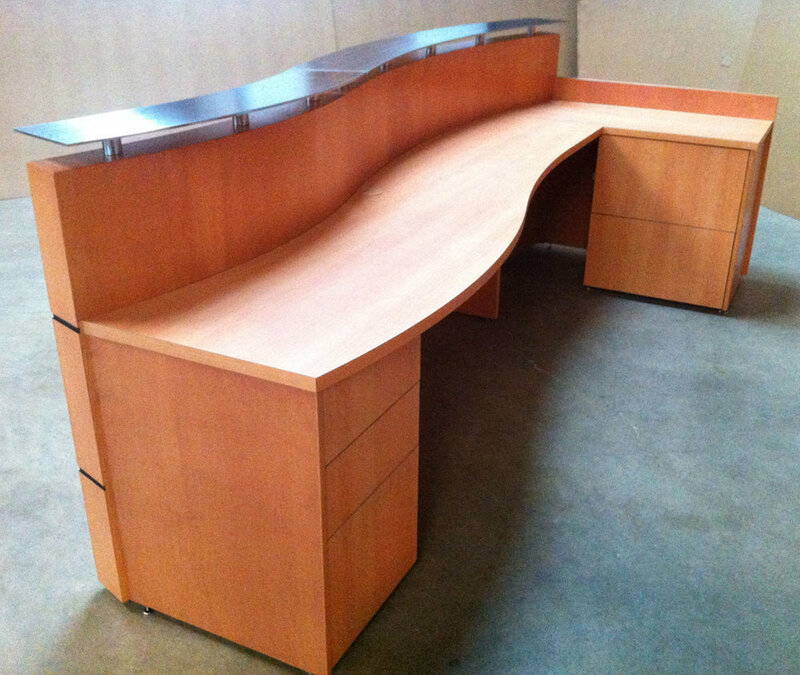 Dramatically curved wood veneer reception desk with two and three-drawer file pedestals. Stainless steel transaction counter on stand-offs contrasts with the cherry surfaces. Our unique extruded anodized aluminum framing system protects counters in high traffic operational areas like mail rooms and this Rolex packaging line. We crafted this one-of-a-kind reception desk for Condé Nast headquarters in patterned stainless steel for the fascia, lacquered wood accents and glass transaction counter. KPMG's reprographics and media organizing facility. Back-to-back stand-up workstations are aluminum framed and feature a central cable access space. 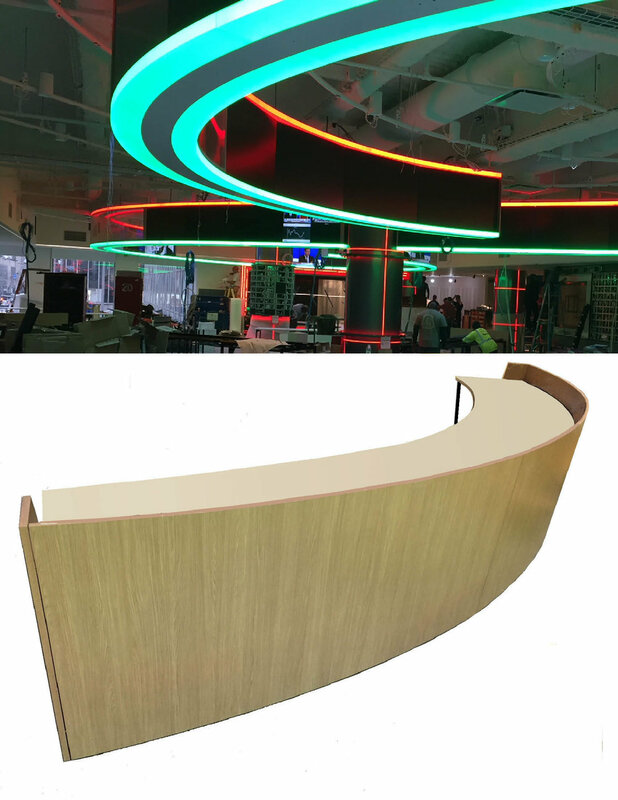 Stations are re-configurable, and durability of the components allow KPMG to re-purpose system elements. We have provided workstations and storage installations for multiple KPMG facilities throughout the Northeast. Our collaborative work tables are available in virtually any material, any size and with multiple connectivity and cable management options. We can also match adjacent systems furniture materials and details to create a cohesive overall design aesthetic.